For anyone who has been following me, I have written a lot about my adventures around Japan. I have been through countless earthquakes, and several typhoons. There are so many earthquakes in Japan that it doesn’t even phase me anymore. At 2:50pm on March 11, 2011, I was leisurely working at my desk at school when I felt a small rumble. It was akin to having the base turned up on a theatre system, but without the sound. It isn’t an uncommon feeling as my school is located above a theatre. Sometimes there are small rumblings that I figure to be the movie down below. You can also liken it to the vibration of a mobile phone, but not directly touching you. After 10-20 seconds, at least that’s how it felt, the rumbling shifted and got noticeably larger. I knew it was an earthquake but as I was conditioned on how earthquakes feel, I didn’t think twice about it. Another 10 seconds or so passed with the second level of rumbling when things suddenly started to accelerate. The rumbling started turning into a jumping. There are two types of earthquakes, the type that sways “left and right” and the others that bounce up and down. This was a bouncing type. I didn’t really notice what was happening. I stood up quickly, and calmly, wondering what we should do. Another teacher/friend also got up and he was just about to head under his desk. I didn’t know if I should follow or not but within half a minute, my manager made the executive decision to clear the school. There were about 3 students at that time and we all made our way down the stairwell and onto the street. Heading into the street was one of the hardest things to do. I was amazed that people in the theatre were asking the theatre staff if they should evacuate or not while in the stairwell. It seemed unnatural to me. I was also surprised to see so many people mulling about in a small lobby inside the building. My only thought was, “let me out of the building and onto the street!” but it was hard to clear out. When I did get out, after about a minute from my school on the 5th floor to the street, I could see hundreds of people on the street. Traffic was moving by this time but the street was filled with people. You could still walk around and get by as the odd car did, but it wasn’t easy. I could see all of wires moving a bit and a mass of confusion as to what to do next. Since I’m just a lowly teacher, I had no power as to what to do, but everyone wanted information. The amazing part was to see what people grabbed as they left. Some people grabbed their purses and others grabbed everything. The old adage of leave everything and just get out is good in practice but doesn’t work in reality. You really never know what you will do until it actually happens. After what felt like 10-15 minutes outside, I wasn’t keeping track of time at all, we finally made our way back in. The strange part was that the theatre told their patrons to head to a nearby park while my school told us to go back. The building looked safe so I figured it was fine. At about 3:30pm, we were starting to get settled in. People were checking the internet and I was sending messages to my friends and family via e-mail and Facebook. That’s when a second quake hit. It was a major aftershock and it sent us piling out into the street again. It wasn’t as long, nor as bad but it was bad enough to make the walls squeak. It’s nearly impossible to explain the sound and feeling together but whenever you watch a horror movie and hear the squeaking of the house shaking as a ghost haunts the house, it’s similar to that. Of course, we cleared out of the school and piled into the street again. It was starting to feel repetitive. On the street, there was one one way to break the tension and that was to make jokes. There was no other way to make light of the situation. We knew it was bad and we understood the severity, but it was either make jokes or have a mental breakdown. Sox: The little one I worried about when I was at work. Once we made our way back into the school, my school decided to stay open for a couple hours before closing at dinner time. I then faced the hardship of how to get home. 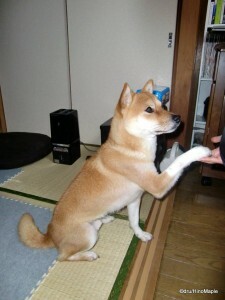 For those who read my other blog, “A Sox Life”, you know that I now have a small Shiba Inu. He was at home and I was at work, so needless to say, I was worried. Thankfully my building manager checked on my place to shut off the water but he didn’t really check on anything else. I rushed home with everyone else in Tokyo. All of the train lines had stopped for obvious reasons. It was dangerous and foolish to run trains without inspecting the tracks and tunnels. Trains themselves had to be inspected to ensure they were safe for transport. I never even bothered to check and see if the trains would run or not and decided to join the hundreds of thousands, if not millions of people walking home. From my school’s branch itself, some had to walk as far as 5 hours, or even more. As another teacher said very recently, “I can’t imagine what people did when their regular commute is 2 hours by train”. Thankfully, from my school to my home, it’s only about 10km, so I only had a 1 hour walk to get home. It was tough to get home as everyone was on the street and walking as fast as they could. Due to the sheer number of people, it was difficult to just get going at a good pace. I took side streets whenever I could but overall, it was slow going. The first biggest shock came when I passed a few old buildings and saw the cracked or broken glass. The second big shock came when I was crossing over the Sumida River and saw the pathway where I run all the time was flooded by a small tsunami. Tokyo is well protected, both naturally and by dykes so that most tsunami are nothing to worry about. While dozens of people stopped to take a quick picture with their camera phones, I kept going thinking about my Sox. I did think about the homeless people who do live along the river and I truly worry about them. I hope they climbed to higher ground which was pretty close, or that an official went by to warn them. I’m not sure but there is nothing I can do about it now. When I got home, I was extremely relieved and nervous at the same time. I had no idea what I would be returning to. I thought twice about using the elevator and decided to walk up the steps. All throughout the stair well there were broken tiles and grout. In Japan, most stair wells in apartment buildings are outdoors and my apartment is no exception. I got to my door to find a light on inside. I was hoping my girlfriend would already be home, but my building manager just left the light on. I don’t really remember what I did first, but I think I headed into my bedroom. My hallway has nothing in it so there was nothing to look for. I opened my bedroom door so I could throw my stuff down and take off my jacket. I opened the door to be greeted by the first mess. I Have two TVs and one had fallen and broken onto the floor. A few drawers were also opened by the force. I checked on the bathroom and found a mess in my sink. The main reason I checked the bathroom was to make sure the laundry machine was somewhat okay. My building manager said it was spraying water all over or broken so I just wanted to make sure it was safe. I finally opened the door to kitchen/living room to greet a scared and happy dog. He rushed to my legs and wouldn’t leave me at all. I tried to turn on the kitchen light but nothing happened. I thought maybe it was broken and turned on the other kitchen light. I know it’s a little vague to describe, but there are two kitchen lights. Once the light came on, I was neither shocked nor surprised. I was more annoyed. 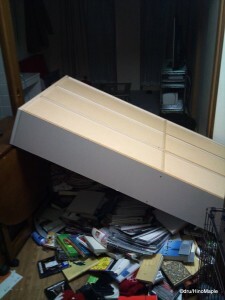 I have a large bookshelf that toppled over leaving books all over the kitchen. I also saw broken dishes, glasses that had fallen from a cupboard above the sink, and some alcohol bottles on the counter. It was a complete mess and I knew my night was just beginning. 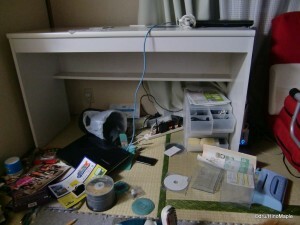 After assessing the damage, I started to clear some of the stuff. I moved some books away and started to put some of the big pieces of glass into a bag. After a bit of time, I finally decided to change. I got back to cleaning the kitchen and just a few small things around the apartment. This was mostly so that I could access everything somewhat easily. 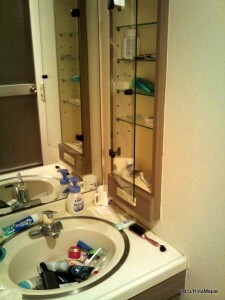 Clearing an area for my bathroom sink was important as it was full of toiletries and it was the only one I could think about using. The main point was trying to clear the bookshelf so I could right it. With glass all over the floor from a broken vodka bottle, it was very slow going. I had to clear the area inch by inch. When I finally had enough space to crawl under the bookshelf, I did just a little cleaning before taking my dog for a walk. It was really short but necessary. Unfortunately he had already peed all over a pillow, which will be in the garbage shortly. 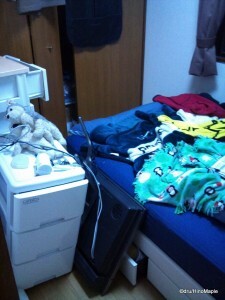 After the short walk, I returned to cleaning. I spend a total of 3 hours before my girlfriend had arrived home. By then, all of the major things were cleaned up. 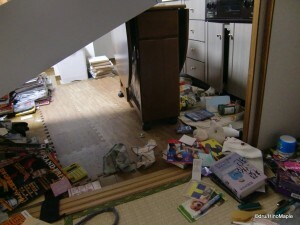 The only things left to do were to clean up the drawers and dishes that had fallen down. We also had to put things back to where they should be, or where they will be in the future. Some things may be moved for safety purposes. I was at that point finally able to go and get dinner. I had eaten lunch around 8 hours earlier and I was starving. Notice the time. 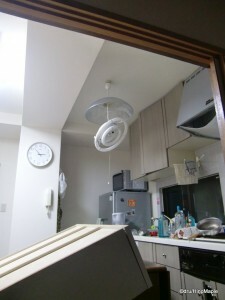 The battery was knocked out during the quake. On my walk home from school, I passed a couple of convenience stores. From reports from my co-workers, almost all of the convenience stores were cleared out by 4pm. It wasn’t a big surprise but it was annoying when I needed to get dinner. There wasn’t really any foods in my house to eat so I headed out to the nearby supermarket without any idea as to what I would find. I found barely anything left. There were a few “corn doughnuts”, some frozen food, and a few pickled vegetables. I never checked the vegetable area as I just wanted a quick dinner which I could eat and get back to cleaning. When I entered the supermarket, I almost immediately headed to the pre-made frozen food section as I could clearly see the prepared food section was nearly empty. I was lucky to grab the very last bag of frozen pasta. It wasn’t much but enough to settle my stomach for the night. I returned home to eat and finish cleaning. I spent another 2-3 hours cleaning and finished sometime after 1am. Probably closer to 2am. I would have continued for another hour or two but it was late and I hadn’t really contacted my friends and family since I started cleaning. During the entire time, I was communicated with friends and family via Facebook and e-mails at work. Once I got home, I only replied to messages a couple times. Twitter and blogging are not a priority as friends and family are the true priority. After, internet social networks are important. I spend another hour and a half doing that, finally heading to bed at 3:30am. Busy train at night. Usually only half the people are there. The next morning, I had to wake up and head into work. My school was opening late, but still opening. I grabbed a quick breakfast and checked the news a little. Replied to many messages and rushed out the door as the trains were not running smoothly. 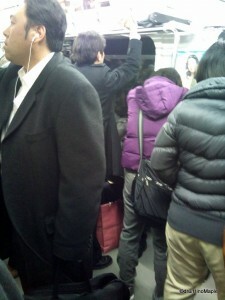 The subways, by reports, were running smoothly, but I take the JR lines. The area around my home was fine and nothing looked too bad other than some damaged facades. No glass, which was good. At the station, there was no information on when the next train would come. I gambled on one and thankfully it was the first to come and leave. I have an option of two trains which take roughly the same amount of time. Unfortunately it took over 15 minutes for my train to come and when it did, it was packed. I changed in Akihabara to find that the Yamanote line had stopped going to Tokyo. The other direction was fine. The only other option was a train on the opposing platform. I joined the ranks in a morning rush hour like train and eventually made it to my work station. I popped into a bakery I always go to for lunch and bought a few pieces of bread, sweet ones only as everything else was sold out, and headed to work. At work, everything looked normal and most teachers made it in. The first few lessons had very few students, but as the afternoon went on, there were a few more students. Some people even decided to go to school to study as they had enough of being home alone, or they just needed something to do. Most places were closed at that time, including most department stores. The only places that were open were a few shops and many restaurants. These are things a lot of people will need as it can be difficult to cook when your place is a mess. Unfortunately, it was difficult for me to work all day. Ever since the initial quake, there were aftershocks almost every hour, if not less. In fact, I had to teach less than 3 hours after the big quake and felt about 5 different aftershocks. The day after the quake, I had a different experience. Most of my students had canceled but I was teaching almost every second lesson. There were still tremors almost every hour or less and it was extremely distracting. It is very hard emotionally to be barraged with aftershocks no matter how big or small. It had been a trying day but in the end, it was over and I got to go home. It is hard to pretend that things are normal. 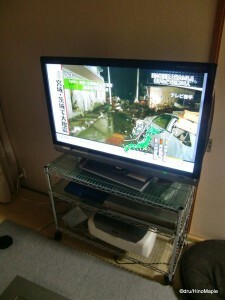 Every TV station has been showing earthquake footage over and over again. You can watch it for about an hour and get the same information. Sometimes there is new information but most of it is all the same. Most people around the world have seen the same information. There is a lot of bad information and a lot of rumours being spread. It’s hard to weed out what is true and what isn’t. The only truth is that the world in Japan has changed again. People try to grasp at something that is “normal” to keep some semblance of sanity. Others pray and others cry. Writing this post hasn’t been easy. I try to recount everything that happened to me and what I observed around me. I have been feeling several aftershocks as I write this and had no chance to really feel “safe”. My own story definitely pales in comparison to those up north as well. Unfortunately there is nothing I can directly do for them at the moment. I hope and pray they are alright, but for now, life moves on. Please Note: I will not be posting regularly for the next couple weeks. While I feel things should go back to normal, I don’t think they can for the moment. I need a little break to regroup. I hope you will understand and I will return. Also note: Due to the timely nature of this post, I had no time to properly edit it. Pictures were mostly taken with my Xperia X10, so the quality isn’t always good. This entry was posted in Japan, Tokyo and tagged 2011 Earthquake, 2011 Japan Earthquake, Earthquake, East Japan Earthquake, Great East Japan Earthquake, Higashi-Nihon Earthquake, Higashi-Nippon Earthquake, japan, Japan Earthquake, Tohoku, tokyo by Dru. Bookmark the permalink.